Fort Worth homeowners and builders are bursting with pride over their stunning hardwood wide plank floors. Industry insiders, builders and homeowners in Fort Worth agree that the most impressive characteristic of wide plank floors is the accent on the wood’s natural beauty. But, strong demand in Fort Worth suggests the attraction runs deeper than pure aesthetics. No matter how many times you see a wide plank floor, you are bound to feel at ease and even a little spellbound. It’s true that every wide plank floor has its own story. By definition, boards in wide plank floors are more than 3 inches across, but Fort Worth buyers prefer wide planks that are 5 inches across or more. In fact, 7 inch planks are often interspersed with narrower boards in a mesmerizing presentation. Below is a list of the woods most used in wide plank floor types. Hickory – Hickory’s renowned toughness and durability make it one of the most popular wide plank floor choices for Fort Worth home and offices. A word to the wise; hickory planks should be coated with thick polyurethane applications to protect against possible shrinking. Oak – Oak is available and performs well when machined to specifications. Oak is popular because it holds stain well and is great for accenting the plank’s unique knots and grain. Birch – Softwood birch is distinctive, but this delicate wood can be hard to find in Fort Worth. When wide boards are available, they sell fast. The wood’s natural tones and varying grains make for a spectacular appearance that boosts property values in a hurry. Maple – This wood’s naturally light finish made the wood a durable and sensible choice for cabinetmakers long before Texas was a state. Maple works especially well as a wide plank flooring surface because it is also abrasion resistant. Cherry – Cherry wide planks are rich in color, come in multiple finishes and hold up well when machined. The red tones are accented by the medium density wood that ages with extreme grace. Pecan – Pecan is beautiful, but is difficult to get and much more expensive than other wood planks. Those deep swirls and wavy, irregular grains are spectacular to see. Walnut – For Fort Worth homeowners who seek dark shaded wide plank floors, here’s the answer. Even though walnut planks require custom ordering, the price is mid-range and surprisingly affordable. This impressive dark wood always makes a lasting impression. Engineered – Don’t rule out engineered wood wide plank floors. With new technology, these floors are reasonably priced, can be installed anywhere in the home or office and are durable and easy to maintain. Whether you are installing below or above grade, engineered wood wide plank floors deserve a look. Fort Worth homeowners are also enjoying wide plank floors with inlaid designs and made from distressed or hand scraped floors. Whichever wide plank floor you choose, consider having the wood faux touched to create that special antique authenticity everyone in Fort Worth seems to want. Despite their relatively high cost, wide plank floors are in vogue in Fort Worth. 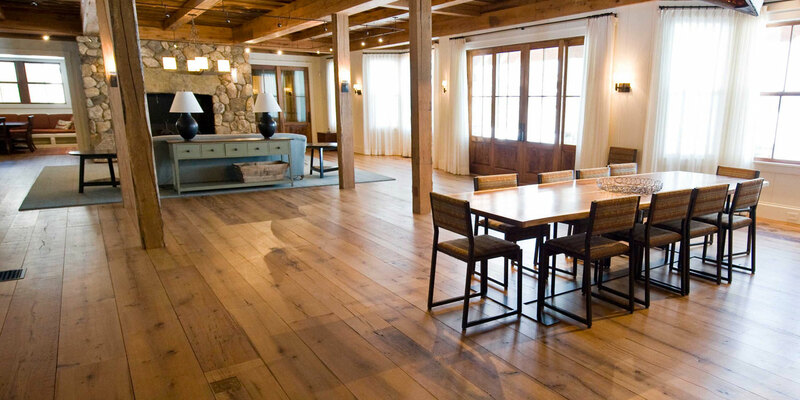 Contact us if you are interested in learning more about our wide plank hardwoods.